Where are the leaders in Election 2010? My grandchildren were running around the yard as I filled out my absentee ballot, and it got me thinking about what this election — described by some as one of the most important in a generation — will mean for their futures in Hawai‘i . I wish I could say I was encouraged, but I wasn’t. From the top of the ballot to the bottom, I saw few candidates capable of inspired leadership or making the basic cultural changes needed to get state and county governments back to the service of the people. As in other recent elections, most races will be won by the old war horses with the biggest treasuries and biggest endorsements by the biggest special interests that view Hawai‘i in terms of their own needs rather than the broad public welfare. These interests back followers, not leaders. After my item a couple of days ago about D.G. “Andy” Anderson, I got into an e-mail exchange with him about his role in helping his nephew Ikaika get elected to the City Council and the need for generational change in Hawai‘i politics. “For some unknown reason,” he said, “I have been invited this campaign year to sit and meet with at least eight or so young people running. I have met with each, from Congress to the City Council, R’s and D’s. “While some are in the wrong races, no money and or organization etc., their sincerity, commitment, education, honesty and qualifications in their particular fields are most impressive. Hawaii is changing however slowly, but I say for the better. I hope he’s right; they can’t arrive too soon. The grandkids, clockwise: Corwin, 14; Isaac, 11; Sloane, 7; Kaylee, 6. This entry was posted on September 6, 2010 at 12:41 am and is filed under Volcanic Ash. You can subscribe via RSS 2.0 feed to this post's comments. 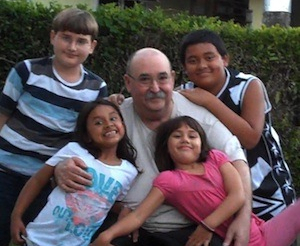 Thank you for sharing this delightful picture of your grandchildren. They are growing up so fast! I’ve already voted by absentee ballot also. We’ll see how this all plays out. Only a few more weeks. Cute photo. A circle of pretty faces; the one in the middle, eh, not so much. What a great photo … what a beautiful family! You know, this is what all this political talk story is about – American families. This remains the heart and soul of our enlightened nation. You say we are without inspired leaders; this is untrue. This is our cynicism taking over. We have some solid candidates this year. I am exited about one from Kaua’i – Gary Hooser. When the divisive issue over Superferry dominated our airwaves, Hooser didn’t pick a side in the debate. He stood for Environmental Law. How can we debate the merits of this proposal until we consider the impacts to the kai and ‘aina? This is putting our keiki and families first. Had the law been followed in the Gulf, it is likely the BP disaster might have been averted. When the divisive issue over Furlough Fridays dominated our talk during the past school year, it was Gary Hooser who called for a Special Session. He wanted to put those responsible for our keiki in one room; this is how we ensure accountability. Yet Hooser was ignored by cowardly leaders and the public was impotent to demand kuleana. We remain divided over the issue of gay marriage. Gary Hooser is clear. America cannot stand unless we demand equality for all. Love is in short supply across the globe. We should never obstruct the love between people -for families come in many flavors. And, we all agree it is not the right of any particular religious organization to demand their views of faith become the law of the land. This is the beauty as well as associated responsibility of the First Amendment. Weeks ago we discussed the role of the Lt. Gov’s position. This is an opportunity to test and train future inspirational leaders. Voting for governor, for example, is a vote for today. The vote for Lt. Gov is a vote for tomorrow. If we do not elected qualified and capable people today, we will be unable to field excellent candidates tomorrow. American corporations are sitting on $1.8 TRILLION in cash … they have pocketed their revenue, neither resuming lending (if they’re banks), nor rehiring laid-off workers nor giving raises to those who have continued to work for them. all branches of our gov’t. are in business with wall street.but let us set good examples to our elected and soon to be elected officials and do good and positve.happy labor day. Youth in and of itself isn’t a harbinger of change. It is always good to hear from Albuquerque, NM resident Scott Goold on who we in Hawaii should vote for. I wish he would post more often. Is Scott Goold currently a voting resident of New Mexico or a former voting resident? Is he not a resident of Kaua`i and registered to vote there? It would be very interesting to check that out as well as critically imporant for reasons not relevant to anything on this particular blog. Nice family, David. I knew about Treena’s children, but I didn’t realize that there were two more grandchildren – I assume their parent is another child of yours. I expect to vote at City Hall sometime over the next 12 days, but you’re right – not much of a selection. NOTE: David and I will have identical ballots since we live within hollering distance of each other. Teach them well, as you were taught. Who in their right mind would run for office nowadays? We are quick to criticize but slow to do much about it except vent and whine. As Joe Hill once said, “Organize!” or something like that. Well, Ann Kobayashi held another cheap stunt “press conference” today (Monday). There must be another debate tomorrow. If she duped the newspaper into printing her wild allegations, Abercrombie can follow through and bring them up tomorrow while waving a headline. More like tag-team mud wrestling. Shame on you for engaging in the Politics of Hatred and Division: distract us from the central issue; divide us with irrelevant and partial facts; discourage us from working together. I can see why you hide your name and face in this blog. Karl Rove would be very proud of you. Your bigotry and racism shows. I WAS NOT born in Hawai’i; apparently you claim superiority to me. I WAS NOT grown here; apparently those imported are inferior to you. I WASflown here … I work, play, volunteer, pay taxes and voice my opinion about my government. Do I need ask your permission? I am grateful for my New Mexico connections (as well as those in California, Idaho, Oregon and Mississippi). My wife is native to Albuquerque. Contrary to your attitude, she would welcome you any time. She is Latina. And, this means a large and robust family. I am thankful they have adopted me. They live aloha and share good will with us. Maybe you could learn something from a culture that knows the meaning of both family and aloha. Wow, talk about leaping down someone’s throat. Gargoyle: It is always good to hear from Albuquerque, NM resident Scott Goold on who we in Hawaii should vote for. Goold: Your bigotry and racism shows. I WAS NOT born in Hawai’i; apparently you claim superiority to me. a tad bit touchy, I would say.